Livestream Studio allows you to use your Livestream Broadcaster device as a remote camera source. Connect your Broadcaster to the same network as the Livestream Studio computer. Power on the device and use the bottom Menu joystick to connect it to the same network that your Livestream Studio system is connected to. After connecting it, push in the joystick to enter the menu and select Stream Mode. Toggle the joystick to Studio. 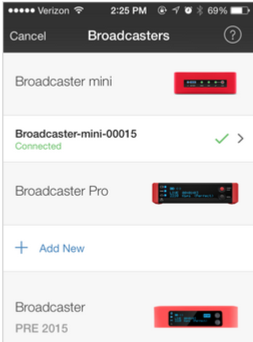 The Broadcaster Pro will indicate that it is connected and ready to send its signal to Livestream Studio. In Livestream Studio, navigate to the Inputs tab in the lower left section. Select Add Input > Remote. You can select your Broadcaster Pro from here, which will add it the bottom of your inputs list and your multi-view. 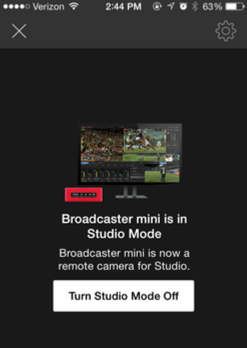 You can also connect a Broadcaster mini to Livestream Studio as a remote camera. When you finish pairing it through the Livestream app, using the same network your Livestream Studio system is connected to, select it from the Broadcaster list. It will open the camera viewfinder. Click on the gearwheel in the top right corner to access settings. Scroll down and you will see Studio Mode. Toggle the switch on (green) to enable Studio Mode. Then click Save in the upper right corner. 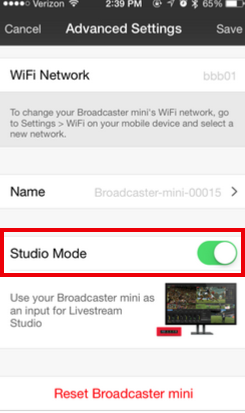 The mobile app will indicate that your Broadcaster mini is in Studio mode. In Livestream Studio, navigate to the Inputs tab in the lower left section. Select Add Input > Remote. 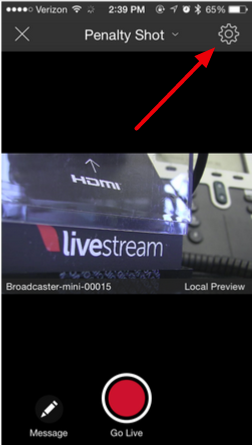 You can select your Broadcaster mini from here, which will add it the bottom of your inputs list and your multi-view. Bringing a Broadcaster into Livestream Studio as a remote camera is very similar to bringing the Broadcaster Pro into Livestream Studio. Select Stream Mode from the Broadcaster menu, and then select Studio. This will activate your Broadcaster as a live remote camera source. In Livestream Studio, navigate to the Inputs tab in the lower left section. Select Add Input > Remote. You can select your Broadcaster from here, which will add it the bottom of your inputs list and your multi-view.